In each beautiful photo, there is a crazy story behind it. 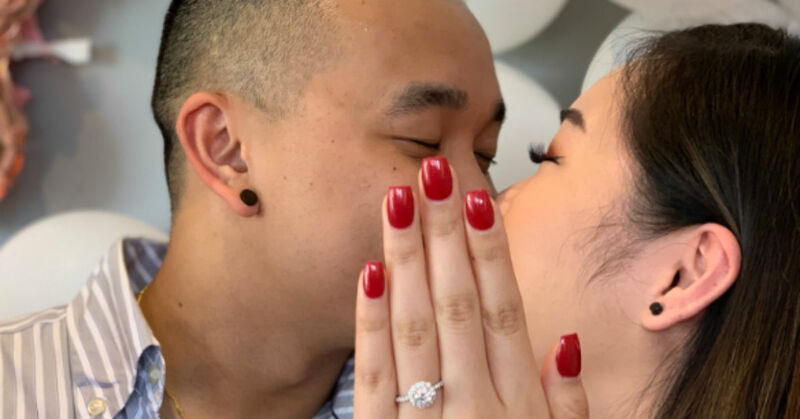 For a woman, engagement proposals happen at the most unexpected time. Once the question is popped and the girl says “yes,” most couples cannot wait to tell the good news to the world – they’re engaged! Some couple would wait to share this amazing news face to face, but others would call their loved ones immediately. Because of the help of technology, most engaged couples would pose for a picture and share it on their social media account to celebrate their engagement. A couple did the latter after getting engaged in Melbourne in the midst of a bunch of flowers and ‘I Love You’ balloons! However, their cute photo is hiding something. One problem that they were able to fix right away – the woman was not expecting it so she did not have her nails done! Luckily, a cousin named Jenna stepped in to help. To solve the woman’s problem, she borrowed her cousin Jenna’s pretty and well-manicured hand to pose for a picture. The bride-to-be gave her cousin the ring to wear, angled the camera to make it look like she was the one showing off the ring in front of her while kissing her partner in the background. Jenna proudly shared the official photo, plus a behind the scenes shot revealing their little secret which many people find hilarious. The official picture was cute, something that you would expect from an engagement picture. But the behind-the-scenes shot explains it all! While the couple was posing for the camera, Jenna can be seen below them, extending her hand up to show off the ring while trying to get a good angle of these two. Must have been pretty challenging! Yet, they were able to find the right angle and the result was amazing. It was surely a very creative idea; something that not all of us would be able to think of right at that moment. According to Jenna’s follow up on her post, she explained why her cousin Diana was not able to get her nails done that day. She said her cousin is a nurse and we all know that nurses fingernails have to be kept short and clean at all times. She also shared that Jose also planned this surprise proposal so they could not get Diana to do her nails without her getting suspicious. The guy convinced Diana that the celebration was for his parent’s wedding anniversary. They kept everything a secret until Jose got on his knees and finally revealed that the party was really for her! This was indeed an engagement proposal that they would never forget. Everyone is hoping that this helpful cousin would get a good role in the wedding for helping them out.